What’s the line on the safety of fish in pregnancy? Most experts agree that besides being yummy, seafood provides great nutrition before, during and after your pregnancy because of the high-quality protein it packs. Ocean fish is our most reliable dietary source of heart-protecting and brain-boosting DHA. Seaford provides essential minerals and vitamins during pregnancy and while nursing, including vitamin D, B-complex, selenium, iodine and zinc. Yet, if you’re pregnant, you should be concerned about eating the right fish in the right amounts to avoid mercury and other contaminants in those fish that should be avoided in pregnancy. Topping this list, both the FDA and the EPA recommend that pregnant women avoid shark, swordfish, king mackerel and tile fish because they contain high levels of mercury. Also, eating more than 6 ounces a week of albacore tuna isn’t recommended (the amount typically in 1 can). Otherwise, leading health authorities say you should eat fish on a regular basis. The National Maternal Nutrition Group suggests eating a minimum of 12 ounces of seafood per week (particularly salmon, tuna, mackerel and sardines). Twelve ounces of fish is generally equal to two cans of chunk light tuna fish. Eating fish helps with your baby’s brain development. Infants need DHA for neural development, and DHA helps to improve vision, as well as your baby’s cognitive, motor and behavioral skills. DHA intake may reduce your risks of preterm birth and help prevent or manage postpartum depression. If you’re not a fish connoisseur, you can get the benefits of the DHA in fish through fish oil supplements, although whole foods are the best way to get DHA for both you and for your baby. So, order up 12 ounces of your favorite (and safe) fish each week and enjoy, knowing you are helping both your body and your baby have the healthiest and safest pregnancy possible. Cooking fish over a grill pan is one of the best ways to enhance its flavor. Baste lightly with olive oil (for additional Omega-3s), add your favorite seasonings, such as coarse sea salt, fresh black pepper, teriyaki, soy sauce or lemon, and grill each filet over medium heat for 2-3 minutes on each side (longer if fish is thicker) and just until the middle of your filet loses its translucence. Serve immediately with a side salad and crusty whole grain bread. 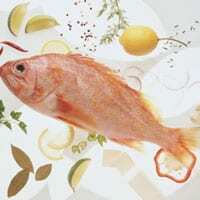 Eating Fish: Are You Getting Enough?